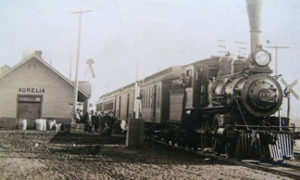 When the railroad was built from Iowa Falls to Sioux City, it is said that more than 80 town sites were laid out along the railroad. Each town had to have a name. John I. Blair, railroad builder, named the town of Aurelia after one of his daughters. Because the government guaranteed compensation for the number of miles of railroad built, the rail line wandered northwest to LeMars and then south to Sioux City, rather than going directly from Iowa Falls to Sioux City, which explains how Aurelia was located on the rail line. Aurelia has the unique position of being equil-distant from Sioux City and Fort Dodge, which in the early days of its history gave the town many marketing advantages. Grain, cattle, and hog buying were important businesses in this area. The first school building was built in 1872 and served the town until 1878 when increased population required a two-story, four rooms building which served the town until 1922. Much of the earliest recreation among the earliest settlers was simply getting together with the neighbors, or church activities. A few neighborhood clubs were organized; many of which still meet. The three churches were the Methodist, organized in 1878, the Congregational, organized in 1883, and St. Paul Lutheran, organized in 1925. Another early church was the German Evangelical Lutheran Church. The Aurelia Public Library was established in September 1917 by a group of public-minded citizens. The first committee voted to pay $1.00 dues for the first few years. Besides donations, there were food sales, chicken pie suppers, social teas, and other days to meet expenses. Open house for the present library building was September 22, 1965. Because transportation was limited in the early days, Aurelia had many businesses that we now travel to larger towns to patronize. Early Aurelia had lumber yards, implement businesses, a furniture store, a jewelry store, tile factory, a bowling alley, and a roller skating rink. Businesses no longer needed, are the cream station, the creamery, the harness shops, blacksmith shops, stock yards, and livestock buying stations, and livery stables. One important business in the early days was the hotel, which not only provided rooms, and living apartments, but was the center for many fancy social events. The history of Aurelia points out one continuing factor; when a community need was discovered, the community pulled together to get the project done. This attitude of community awareness and togetherness is just as great today as it was in the past.